Last update : 26 April 2019. 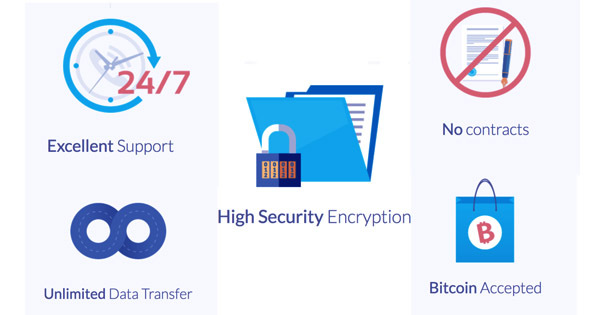 The subject of our in-depth DediSeedBox review is located in the Netherlands and offers very great solutions for people who want to download, share or store hundreds or thousands of Go of files. In fact, with very performant an interface and a very good price competitiveness, this Seedbox provider really convinced us during our DediSeedBox review. As you’ll see during this detailed test and review, it still does not manage to reach our podium. Indeed, this is not the best Seedbox on the market even though it’s really not far. To discover the reasons that make it one of the best, let’s start this in-depth DediSeedBox review. As a matter of fact, the email answer can sometimes be very long (in general, a few hours) and this is no match for the few seconds of waiting time you’d have with RapidSeedBox for instance. Yet, our DediSeedBox review remains positive as the quality of the answer is quite good. Indeed, even though you may sometimes wait a few hours, the client support is really professional and will answer at any time. Be it 3pm or 3am, you can hope for an answer. Unfortunately, sometimes, during night time, there is less employees working. Therefore, the waiting time is way longer that during day time. In the end, we graded it with a 7.5/10 in this first section of our DediSeedBox review. This is not that bad because, as we said earlier, this client support is 24/7 available which is already very very good. Yet, we’ve got to be very exigent to enable you to compare the different Seedbox providers. Indeed, as all offer a 24/7 support, we can’t only rely on this criterion in our in-depth reviews. As you’ll see later during this DediSeedBox review, it easily catches up its delay in this first section with very good grades in the third and fourth section in which we’ll look into the quality and the extremely competitive tarification. Second criterion of our DediSeedBox review, the choice of Seedboxes is there very limited. Indeed, we were a bit frustrated to find only 3 solutions… In addition to this restricted number of Seedboxes, the solutions won’t be suitable for everyone. Indeed, the entrance package is already a 1TB VPS which is a lot for people who want to discover the world of Seedboxes or for those who just need a small disk space. If we go into details, this first offer will cost you 15$ without VAT for 1TB of storage. The second solution is the 1.5TB VPS at a price of 20$ a month. Finally, the third solution is the 2TB VPS at 25$ without VAT a month. As you’ll see at the end of this DediSeedBox review, these prices are extremely competitive, but this is not the subject of this section. In the end, a person who wants a little Seedbox won’t be satisfied with these very big solutions. The same goes for someone who would want very big solution. Indeed, 2TB is not that much and some people are looking for 3 or 4TB of storage… Indeed, nowadays, all the date, be it videos, photos, documents, are taking an ever bigger place in our life. Their quality being better, they definitely need bigger storage place. Even though this is not the thing we’re presenting there, you’ll also be able to rent dedicated servers. These will enable you to do anything as if you had a real server in your house. As far as dedicated servers are concerned, DediSeedbox offers quite a good choice. Indeed, there are 6 different solution in 3 different countries (Netherlands, France and Canada) which is really great. 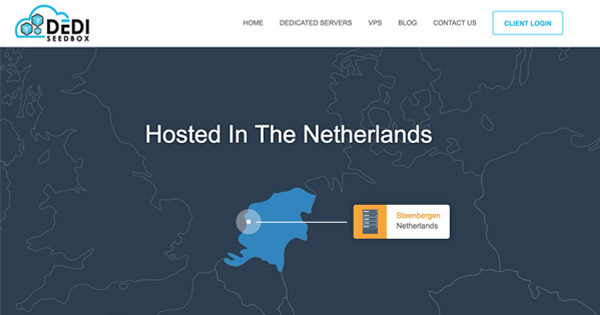 If you’re interested in dedicated servers, we invite you to check their official website. In the end, our grade for this section of our in-depth DediSeedBox review is 7.5/10 because of this very limited choice… Even though the quality/price ratio is juste excellent, we would really have liked to find a smaller AND a bigger solution. In the next section of our DediSeedBox review, we’ll have a look at the quality of the interface. As you’ll see, DediSeedBox won’t disappoint you there ! As far as the quality of the interface is concerned, our DediSeedBox review is really very positive. In fact, it offers a very good 2Gb/s connection speed on its 3 different solutions that we’ve just presented above. You’ll really be able to download and share at a crazy speed. During our test, the maximum speed we managed to get in download was 180MB/s and 140 in upload. This is definitely crazy. Indeed, that means that you can download a 3GB movie in approximately 20s… Furthermore the availability is excellent and very close to 100%. During our 1 month test, there was just a little bug that lasted less than a few minutes. Let alone this bug, everything worked perfectly ! 24/7 you’ll always be able to access your VPS. What we also enjoyed during our DediSeedBox review is the fact that, contrary to Seedbox.fr, there is absolutely no limit as far as the number of files simultaneously active is concerned. The same goes for the bandwidth which is unlimited too ! As far as security is concerned, you’ll notice that, as many of its competitors, it included OpenVPN. Therefore, you’ll be perfectly protected and no one will be able to spy on you while you download movies, series,… The other software that we really enjoyed during our DediSeedBox review is Plex. Indeed, we think that it is almost compulsory, nowadays, to have this wonderful application on your Seedbox. It will enable you to stream all the files you’ve got on your Seedbox remotely from a large number of supports. We can think of your iPad, your Apple TV, your phone,…to name but three ! Our grade for this section of our in-depth DediSeedBox review is 9/10 which is among the bests on the market. We would have liked to find an even better connection speed (5, 10 or even 20Gb/s) to give it a better grade. Furthermore, even though we had only 1 bug, it is 1 more than all other tests we did… In the next and last section of our DediSeedBox review, we’ll conclude with the tarification of the 3 different solutions. The conclusion of our DediSeedBox review is, as always, about the tarification. As always, we’ll compare the prices in $/Go stored in order to help you find the best on the market. Note that the prices are VAT excluded an that the real price you’ll pay will be 20% more expensive. Also note that you’ll get significant discounts if you rent your Seedbox for a trimester, semester or a year. The first offer is 1To of storage for 15$ a month. That makes 1,5 cent$ / Go / month which is already very very good. As you’ll see, it will become even better as the disk space will get bigger. The second solution, offers 1,5To of storage for 20$ a month. That makes 1,33 cent$ / Go / month which is really really good. 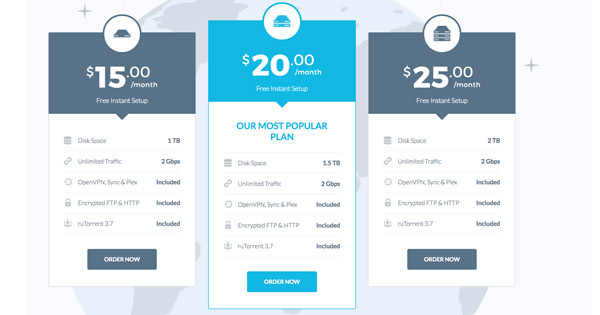 Finally, the third offer is 2To big and will cost you 25$ a month. That makes 1,25 cent$ / Go / month which is definitely among the bests on the market. When it comes to means of payment, you’ll be a bit limited compared to what we can find with the other competitors. Indeed, you’ll only be able to pay with Visa, Mastercard or Maestro. No PayPal, no Bitcoins or other mean of payment… Still, this did not have any consequence on the grade of our DediSeedBox review in this section. Indeed, the latter is still perfect with a 10/10. As a matter of fact, the quality/price ratio is really hard to be beaten. Just below, discover a very short summary of the Pros and Cons that we put forward during this in-depth DediSeedBox review. Pros : The quality of the interface, the 2Gb/s connection speed, the compatibility with Plex and the awesome price competitiveness. Cons : The client support which is a bit slow and only reachable via email and the very limited number of VPS. With almost unbeatable a quality/price ratio, the subject of our in-depth DediSeedBox review end up with an average grade of 8.5/10. We would definitely have enjoyed to find more responsive a client support and a larger choice of Seedboxes. Yet, you can’t have everything ! It is an excellent Seedbox provider with very cheap prices and furthermore, it is compatible with Plex !